Home darjeeling tea After Darjeeling tea, can Darjeeling coffee be the next big thing? After Darjeeling tea, can Darjeeling coffee be the next big thing? The North East of India, with its rolling hills and verdant plantations, has long been synonymous with tea. Coffee – that dark, moody brew, lightened with milk, and frothed to perfection by rigorous pouring and mixing – largely remained a South Indian phenomenon, with most of the plantations located in Karnataka, Tamil Nadu and Kerala. But as the Indian economy opened up, global café chains such as Costa Coffee and Starbucks set up shop and took coffee to various parts of the country. They were followed by entrepreneurs who rode the artisanal wave and introduced Indians to pourovers and Chemex. And now, in the North East too, there is a silent coffee storm brewing, thanks to a handful of cafes, roasters, government-backed guilds and organic farmers, who are betting big on locally-grown coffee. 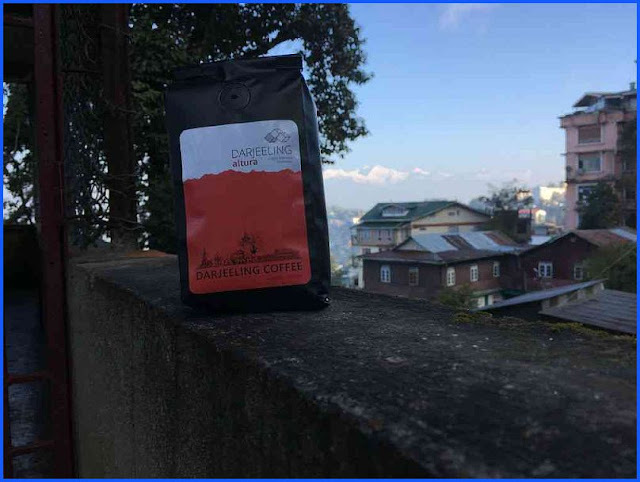 Beans grown by roasters such as Meghalaya’s Smoky Falls Tribe Coffee, Nagaland’s Été Coffee and Darjeeling Altura (an offshoot of the famous Beatles-inspired hotel Revolver in Darjeeling) are making their way to cafes and restaurants in the region and even being exported to countries like Singapore. Several artisanal coffee shops have mushroomed in towns and cities such as Kohima, Dimapur, Shillong, Gangtok, Darjeeling, Siliguri, Kalimpong, Guwahati, Imphal, Naharlagun, Tawang and Aizawl – all serving up delicious lattes and long blacks, complete with coffee art. In the late 1980s, the Coffee Board of India, the governmental organisation tasked with promotion of coffee in the country, began to develop coffee plantations in the North East, partnering with nodal agencies on the ground. But this was soon discontinued. The agencies became defunct and the board began to implement its coffee development scheme directly by offering subsidies and training to farmers. The main goal was to provide livelihood to tribal communities and detract them from pursuing jhum or swidden cultivation. According to the latest statistics from the Coffee Board in May 2018, out of an 8,013-hectare planted area in the North East, about 3,000 hectares is yielding area, and the rest is in the pre-yielding stage – coffee cherries take three to four years to grow. The Board’s November 2017 report had placed the total planted area at 7,501 hectares, which indicates that 512 hectares were planted with fresh saplings in the region within a few months – a marker of how rapidly local farmers are embracing coffee cultivation. Only 200 metric tonnes are being produced annually – yield levels are still low because the climate and geography of the Himalayas are not as conducive to large-scale coffee cultivation as in the Western Ghats. Also, farmers in the Himalayas still continue to treat coffee as ancillary income as compared to growing pepper, says Y Raghuramulu, director of research, Coffee Board of India. So what has contributed to the growing popularity of coffee growing in the region? Another advantage is that coffee from the North East is more or less organic, which appeals to new-age consumers and artisanal roasters alike. Eté consists of a 19-member team that runs a mobile coffee bar, a roastery, and a brick-and-mortar coffee bar. It has so far sold around 20,000 packs of coffee, provided consultancy services and powered up 13 cafes in Nagaland, Manipur, Delhi and Singapore. Quality control is strict – only 100% organic Arabica is used, sourced from six districts in Nagaland. When they started, an online shopping site was launched for pan-India retail. But as local demand superseded the produce, they were compelled to put it on hold. The Nagaland government has pledged to set up 50,000 hectares of coffee plantations by 2030. Local farmers are being encouraged to give up the traditional practice of Jhum farming, and embrace shade coffee cultivation instead. The two-year-old Nagaland Coffee, a subsidiary of a South African company with a memorandum of understanding for 30 years with the state, deals directly with coffee growers in rural Nagaland. It exports single origin organic coffee to the Persian Gulf and South Africa, and supplies to its coffee shop in Dimapur. Most of these businesses are possessed by a conscientious zeal. Été Coffee’s tagline is Justice a Cup, while both Darjeeling Altura and the café and bookstore Nerdvana, also in Darjeeling, are champions of sustainable economy. “Our philosophy is equity – we’d want to earn our share from our coffee while providing fair and equitable shares for the farmers from whom we purchase the cherries, and the few retailers and cafes that have been patronising Darjeeling Altura,” said Dewan. Été earmarks 10% of its earnings for its Employability of Youth Fund that sponsors local youths who are willing to undergo skills training to become employable. One of the more interesting aspects of this trend is that none of the stakeholders held international certifications when they started, and most are driven by a passion for coffee. Darjeeling Altura, for example, started off with a few saplings that yielded good beans. These were processed and roasted in 2014 with a good deal of help from YouTube and a lot of reading.